Camsell Portage is a beautiful northern settlement that remains Saskatchewan’s most northern and isolated community. An airstrip provides year-round access by plane. In winter, residents can travel by snowmobile to Uranium City, 36 kilometers east. There’s also a summer road connecting Camsell Portage to the community of Waterloo Lake, 14 kilometers to the west. During peak activities near Uranium City, Camsell Portage had a population of more than 300 people. Today, between eight and 15 residents remain in the community year-round. Camsell Portage was settled by trappers who arrived during the 1900’s from Lac La Biche, the Northwest Territories and Fort Fitzgerald, Alberta who used it as a historical portage route to the north. 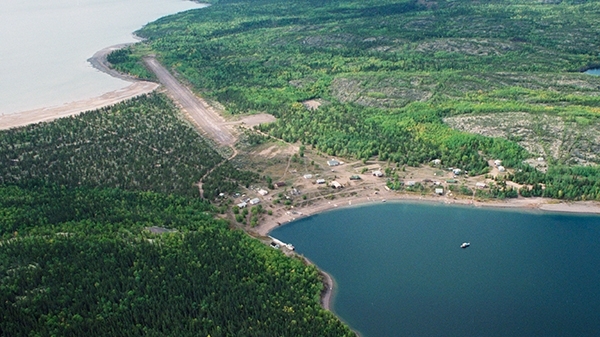 It is a unique Dene community located on the north central shore of Lake Athabasca where residents continue a traditional life, living off the land by way of fish, game and fur. Camsell Portage maintains an air strip, a northern settlement office, a church and a school that is now used as a health centre and community hall. Despite its remoteness, satellite TV and high speed internet services are offered in the community. In June, 2016 Camsell Portage, along with the First Nations of Black Lake, Fond du Lac and Hatchet Lake, and communities of Stony Rapids, Wollaston Lake, and Uranium City signed a historic collaboration agreement with Cameco and Orano (formerly AREVA Resources). The Yá thi Néné Collaboration Agreement is designed to enhance workforce and business development, environmental stewardship and community investment in the Athabasca Basin. The Yá thi Néné Joint Implementation Committee has released a 2017 Report to Community Members outlining progress made from the date of signing to the end of the year.